Amazingly, one-third of the American workforce is freelance -- that's 42 million people who have to wrestle with not just doing the work, but finding the work, then getting paid for the work, plus health care, taxes, setting up an office, marketing, and so on. Now help is here, and consultants, independent contractors, the self-employed, "solopreneurs," and everyone else living a freelancer's life will never be alone again but instead can be part of a strong and vibrant community. 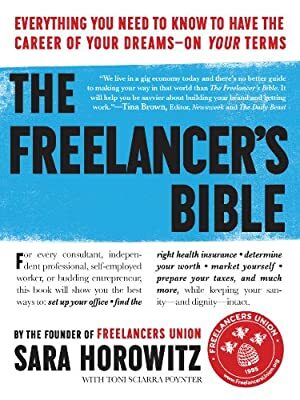 Written by the authority on freelance working, Sara Horowitz, MacArthur "Genius" Fellow and founder of the national Freelancers Union and, most recently, the Freelancers Insurance Company, The Freelancer's Bible will help those new to freelancing learn the ropes, and will help those who've been freelancing for a while grow and expand. It's the one-stop, all-encompassing guide to every practical detail and challenge of being a nimble, flexible, and successful freelancer: the three essentials of getting clients and the three most important ways to keep them happy. Five fee-setting strategies. Thirteen tactics for making it through a prolonged dry spell. Setting up a home office vs. renting space. The one-hour contract. A dozen negotiating dos and don'ts. Building and maintaining your reputation. Dealing with deadbeats. Health Insurance 101. Record-keeping and taxes. Productivity, including a quiz: "What Is Your Ideal Day?" Building a community. Subcontracting and other strategies for taking your freelancing career to the next level. Retirement plans, plans for saving for education, and how to achieve financial freedom. Track It. This book has been $7.79 within the past year. Log In to track Sara Horowitz on eReaderIQ. to be notified each time the price drops on any book by Sara Horowitz. to stop tracking Sara Horowitz. Log In to track Toni Sciarra Poynter on eReaderIQ. to be notified each time the price drops on any book by Toni Sciarra Poynter. to stop tracking Toni Sciarra Poynter. We started tracking this book on January 11, 2013. This book was $9.87 when we started tracking it. The price of this book has changed 39 times in the past 2,289 days. The current price of this book is $9.61 last checked 20 hours ago. This lowest price this book has been offered at in the past 90 days is $9.36. This lowest price this book has been offered at in the past six months is $9.04. This lowest price this book has been offered at in the past year is $7.79. The lowest price to date was $1.20 last reached on March 1, 2018. The highest price to date was $9.99 last reached on February 2, 2017. We last verified the price of this book about 20 hours ago. At that time, the price was $9.61. This price is subject to change. The price displayed on the Amazon.com website at the time of purchase is the price you will pay for this book. Please confirm the price before making any purchases.